Background: The blood-brain barrier (BBB) is a major obstacle in the treatment of brain tumors. Intra-arterial (IA) administration with osmotic BBB disruption (BBBD) allows greater drug delivery to the central nervous system (CNS). Its use with temozolomide (TMZ), the first-line agent in the treatment of glioblastoma, has never been reported in an animal glioma model. Objective: This study was designed to investigate whether increased TMZ delivery would improve survival in the Fischer-F98 glioma model. Methods: Alternative methods of administration for TMZ (200 mg/m2) were tested, comparing intravenous infusions (IV, n=13) to IA (n=13) or BBBD with IA (n=13). IA normal saline (NS) was used as a control group (n=13). Five rats per group also underwent radiotherapy. Survival and adverse effects were measured. TMZ was quantified in plasma, CSF and brain at three time-points post-TMZ infusion (IV, IA or IA+BBBD) by LC-MS\MS. Results: Compared to IV, higher peak TMZ concentrations were observed in brain tumor (BT) tissues with IA and IA+BBBD infusions (4-fold and 5-fold, respectively). No difference in survival was observed between the IA with/without BBBD vs. IV/control groups. Radiotherapy increased survival independently of the method of TMZ delivery. Conclusion: We show that the enhanced delivery of TMZ by IA infusion (with/without BBBD) does not improve survival in this resistant model. However, the method of TMZ administration has a significant impact on CNS delivery. 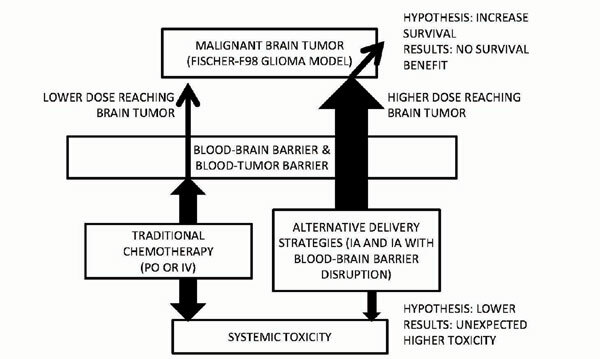 Bypassing the BBB with judicious use of local delivery approaches and appropriate therapeutic agents has potential for the treatment of glioblastomas. Blood-brain barrier, Blood-brain barrier disruption, Drug delivery, F98 cells, Glioblastoma multiforme, Temozolomide.